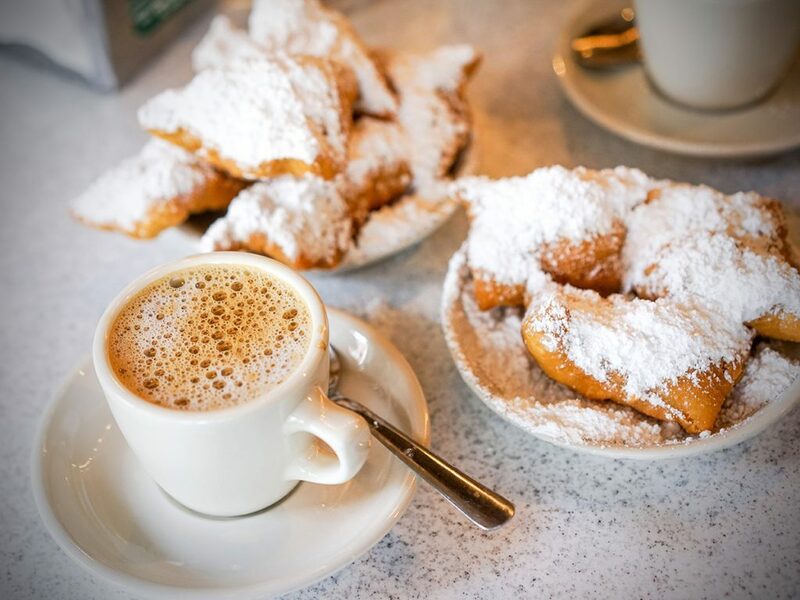 Grab your beignets and coffee. It’s time for the 2018 Legal Marketing Association Pre-Conference! Don’t forget to download the conference app to build your agenda, connect with attendees and much more. For download instructions, visit www.LMAConference.com/downloadapp. Poston Communications is once again proudly serving as the 2018 Legal Marketing Association Annual Conference Daily Conference News sponsor, publisher and editor. 6:00 – 7:30 pm Welcome Reception in the exhibit hall (Elite A): The exhibit hall opens in full force with the Welcome Reception. Join your colleagues in the exhibit hall and mingle with exhibitors. #LMA18 in New Orleans is bringing an emphasis on psychological and physical well-being as Professor Catherine Sanderson presents The Science of Happiness. She will describe cutting-edge research from the field of positive psychology on the factors that do (and do not) predict happiness, and provide participants with practical (and relatively easy!) ways to increase their own psychological well-being. Q. How did you begin studying in the field of positive psychology? A. When I was a graduate student early in my career, I focused on two distinct and separate lines of research: health psychology and predictors of physical well-being and relationship satisfaction, focusing on how people find and maintain friendships, romantic relationships and other kinds of relationships. Over the last 20 years, I’ve found that those aren’t separate lines of research. Good relationships are predictors of good health. How long you live, how fast you recover from surgery and other health indicators are based on having high-quality relationships. These two disparate lines of research that I was examining have melded into one, particularly over the past five years as this field has really taken off. It is fascinating how those lines have really linked up. Q. What was the biggest surprise or aha! moment in your research? A. For me, the biggest surprise is we’re wrong about what makes us happy. We all say, “I want to be happy;” we all say, “I want my kids to be happy.” It’s not mysterious, new or novel but what did surprise me is that we’re going about it the wrong way. For example, I want to lose weight, but I eat a whole lot of donuts. I’m going about weight loss the wrong way and it doesn’t work, unfortunately. It’s the same with happiness. Finding meaning in your life is an extraordinarily strong predictor of happiness. Some may find religious and spiritual beliefs give meaning, so they belong to a temple or church. Others find meaning through volunteering and teaching. Research shows people frame situations in very different ways. For many people, happiness doesn’t come easily or naturally, and they must make conscious choices and decisions. For example, I know I’ll feel better if I take a walk instead of checking social media. For some people, happiness means getting off social media and not wallowing in the perceived imperfection of their own lives. Q. How can we find happiness even during challenges and stressful situations? A. I personally find meaning in giving this talk on happiness. Invariably, people come up to me afterward with tears in their eyes sharing that they have experienced a catastrophic personal loss and thought they would never be happy again but now realize that happiness is within. Happiness is achievable for all of us. I give this talk about three times a week all over the country, and I always start my talk by saying I’m not someone that’s naturally happy. Some people are, but I’m not one of them. I look at happiness like metabolism: Some people eat whatever they want and never gain weight, and that’s wonderful. If you’re not one of those people, you must take extra steps to watch your diet and be mindful. I look at happiness the same way. There are some people who don’t need this talk because they are already happy. This talk validates them, and they say now I know why I’m so happy. People who don’t have that natural tendency and experience can learn strategies to make life changes. You can find happiness no matter what; it’s not about our circumstances. Even with a job that is stressful and demanding, people can find moments of meaning. Maybe it’s doing something nice for someone you work with who’s going through a hard time or knowing the name of the security guard and saying good morning. Research shows that even a two-minute conversation with a stranger can make us happier and make us feel good. Maybe you say to yourself, “This is my job, and I do my job because it pays my bills, but I’m going to make sure that I do something that I find meaningful for two hours every weekend such as volunteering or hiking.” Remind yourself that your job is your job but it’s not your life. Q. How can conferences and being a part of a community like LMA make us happier? A. People like going to conferences for the chance to connect and share similar experiences with their colleagues. Building relationships is a predictor of happiness and that can include all different kinds of relationship with colleagues and professionals in our field. Those kinds of relationships are tremendously rewarding and valuable. Learn more about Dr. Sanderson’s work here. Q. What are some of the highlights of this year’s conference? Ashraf: There are some many exciting things coming up and we’ll highlight a few. I’m looking forward to our keynote speaker Catherine Sanderson discussing the science of happiness. Betsi and I saw her at another program last year, and it just clicked for both of us. I’m excited for her energy and uplifting message to kick off our conference Tuesday morning. Betsi: Given many of the conversations in the legal industry around health and wellness, this topic is so timely right now. We are in a very stressful industry, and the expectations are high to deliver time after time. We need to take care of ourselves before we can really take care of others. We don’t talk about issues around mental health and well-being enough in our industry, and it’s really important. Ashraf: When we do talk or read about these issues, it’s typically in the context of lawyers, but it’s really a broader conversation about the legal industry. That’s why we’re so excited about having the conversation at the annual conference. This is an opportunity to get a different perspective. I’m also excited about the continuation of the mentoring program we started back in 2015. Although we’re an extremely friendly community, I know from first-hand experience that it can be very intimidating to walk into the conference for the first time. Our mentorship program pairs up first-time attendees with those who have been to the conference before. There’s a call for the program participants before the conference to talk about navigating the conference activities. We also set up a meeting with mentees and mentors early in the conference to break the ice and help people create new relationships. It’s really a way for us to welcome new conference attendees and help to ensure they maximize their experience. As always, our pre-conference program is strong and this year, we added two new sessions – one on coaching and another on leadership. Betsi: We’re also continuing the conversation about Diversity and Inclusion with another Town Hall. And we’re introducing a new concept as an extension of our exhibit hall called the Lagniappe Lounge. For those not familiar, lagniappe is the concept of giving a little something extra. We added this as an opportunity for service providers to provide quick demos at designated times that attendees can sign up to attend. We’ve done this for the past couple years at the P3 conference, but this is the first time at the annual conference. I’m also really pleased that most if not all of our regions are hosting an event so that their groups can connect as well. There are lots of opportunities for attendees to make connections whether through the mentoring program, a regional reception or the many other networking opportunities. Q. How does this conference further the mission and goals of LMA? Ashraf: The goal of LMA is to create a welcoming community for professional development. We now have technology that allows the learning and experience to travel real-time from session to session as well as reach the LMA community who couldn’t attend the conference. Whether it’s following on social media or taking advantage of the conference recordings, the lessons learned are no longer only for attendees. In addition to the learning opportunities, the energy, enthusiasm and ideas that are created help guide the organization for the rest of the year. Gathering together to realize the value of the network is a huge win for the organization. LMA is thriving thanks to the engagement of our members and our annual conference is when we all connect to see it in person. On your chair at lunch on Tuesday, April 10, you’ll find a fun word puzzle to complete between chatting with friends, checking in on emails from home, and eating. Submit your completed puzzle for a chance to win an Apple Watch (instructions included on the puzzle itself). The game is courtesy of our lunch sponsors, JD Supra. Thomson Reuters Legal Business Development Solutions is hosting a complimentary yoga session at 7:00 am on Wednesday, April 11, in Elite B – next to the exhibit hall. Space is limited! Visit booth 305 to register. 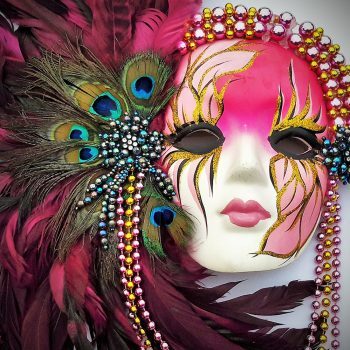 Laissez les Bons Temps Rouler — Let the Good Times Roll! 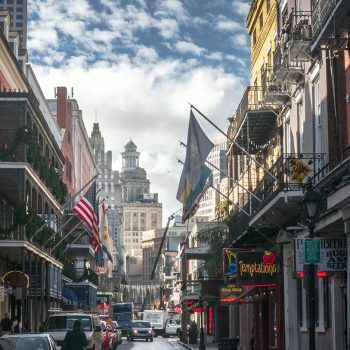 Located in the heart of Champions Square, club XLIV (named to honor the victory by the New Orleans Saints in Super Bowl XLIV), is one of the city’s premier lounges. Meet in Celestin Foyer at 6:00 pm to join a New Orleans Brass Band Parade to the reception venue. Sponsored by OneNorth. 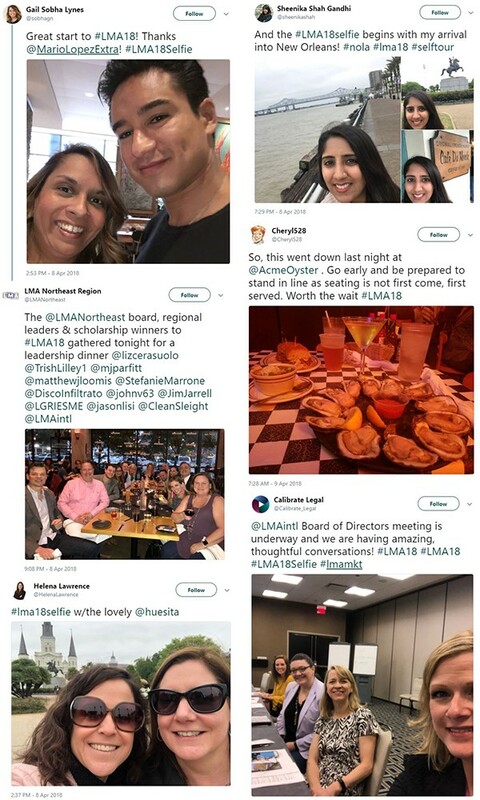 Share scenes and selfies with @lmaintl on Twitter and Instagram using the hashtag #LMA18.